…clearly I am not describing myself, unless of course women who are six feet tall are suddenly deemed ‘tiny’. 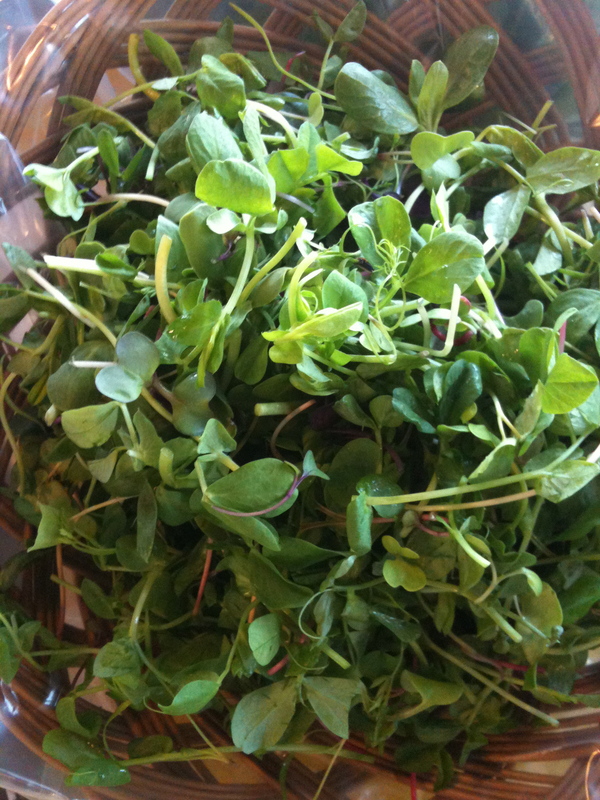 No, ‘tiny but intense’ best befits micro-greens. Let me tell you, I cannot get my fill of these petite doses of green. And, in this ‘super-sized’ world we live in, it is so incredibly refreshing to find something so wonderfully tasty in micro-size. Hitting the last few indoor farmers markets, the biggest clue that we are nearing outdoor market season (fyi…Green City kicks off the outdoor Chicago area farmers market season on May 12th. How excited am I?!?) is the presence of the micro-greens. 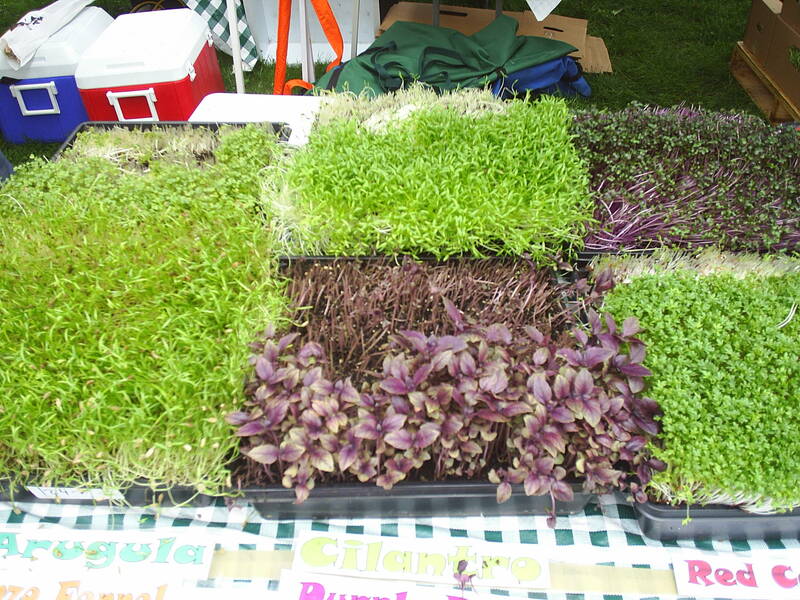 Nothing complicated or exotic here, micro-greens are simply the seedlings that are harvested before developing into mature greens and/or herbs. 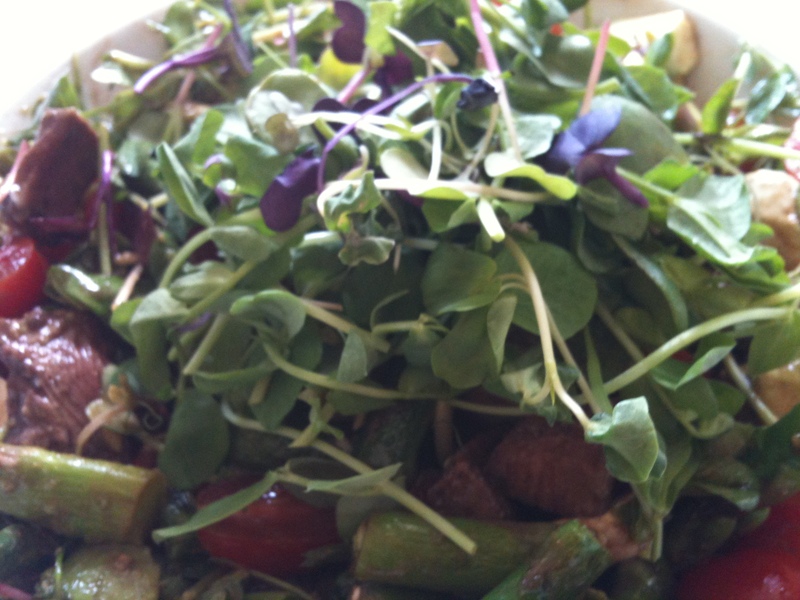 Oh, but add a few micro-greens to a dish and turn on the instant ‘wow’ factor. Those you are feeding just might think they are being served something complex and exotic, when all you prepared was a simple omelet that suddenly looks fresher, prettier and most important, tastier. I dare not call them ‘cute’. No, nothing ‘cute’ could pack such a punch of flavor and nutrition. Think of them as a super concentrated form of vitamins, minerals, enzymes and a zing of flavor. A great way to sneak in more ‘healthy’ into any dish. And back to ‘keep it simple’ in the kitchen, what could be easier than adding some to a sandwich or wrap (boy that trumps a flavorless leaf of iceberg), garnish a pizza, quesadilla, stir fry, or piece of grilled fish, add to sushi and maki rolls, salads, or forget the mature salad greens and make a salad using only micro greens. The other day I gave my favorite Spring dish of grilled asparagus topped with a fried egg the ‘wow’ factor with a topping of Three Sisters Garden mixed mirco-greens. I did not think I could love this dish more. Wow, I do love this dish more. Some of my favorite sources for la petite greens are Three Sisters Garden mixed micros and petite pea greens, Tiny Greens for, oh where do I begin, bronze fennel, radish, curly cress, arugula, amaranth, onion, sunflower, to name a handful, and Heritage Prairie Farms for mixed micros. I recommend using your greens soon after getting them home, but if you are not ready to use right away, store in a closed container (the plastic bag or container you brought them home in are perfectly fine) in the fridge for up to a week. This entry was posted in To Market with Mo and tagged Andersonville Farmers Market, Chicago Area farmers marekts, Chicago Farmer's Markets, Evanston Farmer's Market, Farmers Markets, food artisans, fresh organic, fresh seasonal organic produce, Glenwood Sunday Market, Heritage Prairie Farms, micro greens, moira's blog, sustainable, Three Sisters Garden, Tiny Greens, to market with mo. Bookmark the permalink.